Arctic sea ice extent in 2016 was the lowest since satellite measurements started, when extent is averaged over the period from March 20 to September 22, as illustrated by the image below. 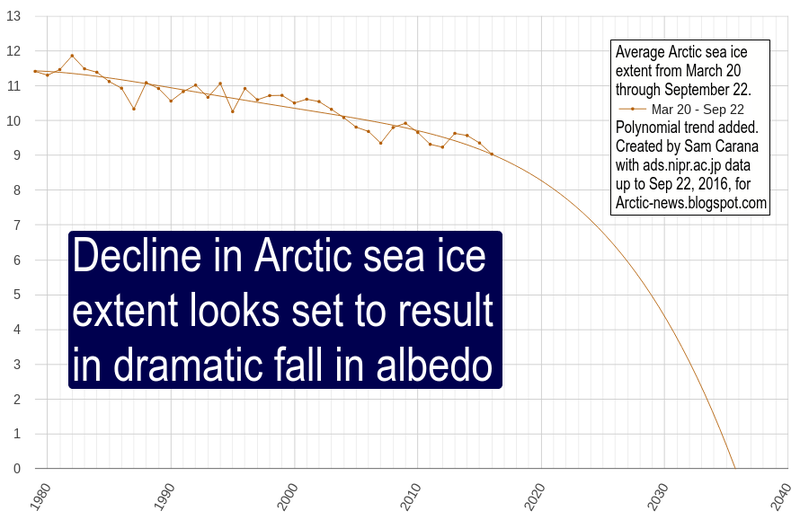 As the added trend also illustrates, this decline in Arctic sea ice extent looks set to further accelerate and result in a dramatic fall in albedo. 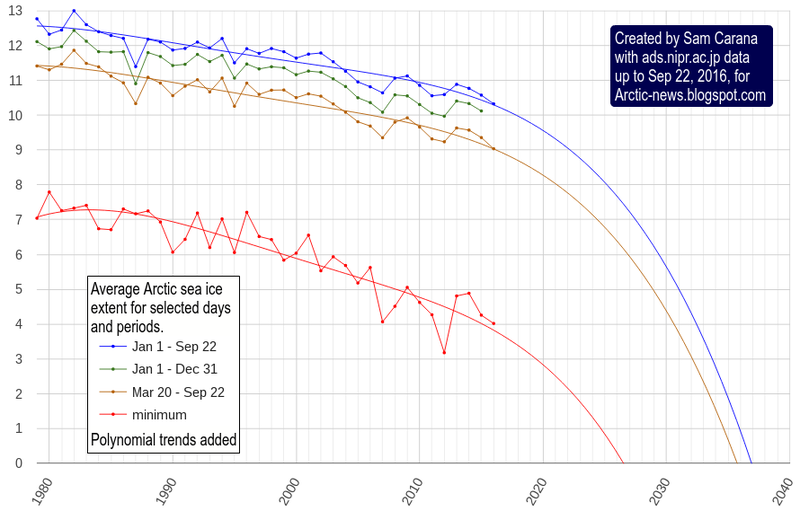 The trend points at zero sea ice over this entire period in less than two decades from now. Zero sea ice on a single day looks set to occur much earlier; a similar trend points at minimum sea ice extent reaching zero in about a decade from now, as illustrated by the image below. Above image also shows average sea ice extent data for the period January 1 to September 22, i.e. the year to date (blue line). The added trend points at zero being reached in 2037. The data show that Arctic sea ice extent also was the lowest since satellite measurements started, when extent is averaged over the period from January 1 to September 22. Finally, the image also shows data for the average sea ice extent over the entire year. Data for 2016 are not available yet, but it does look like 2016 will also be have the lowest sea ice extent when averaged over the entire year. 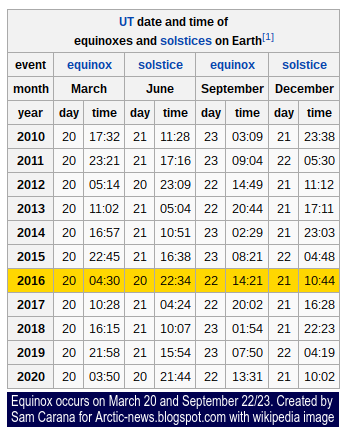 Anyway, the period between the equinoxes of March 20 and September 22/23 is most important, as the Arctic receives most sunlight during this period. 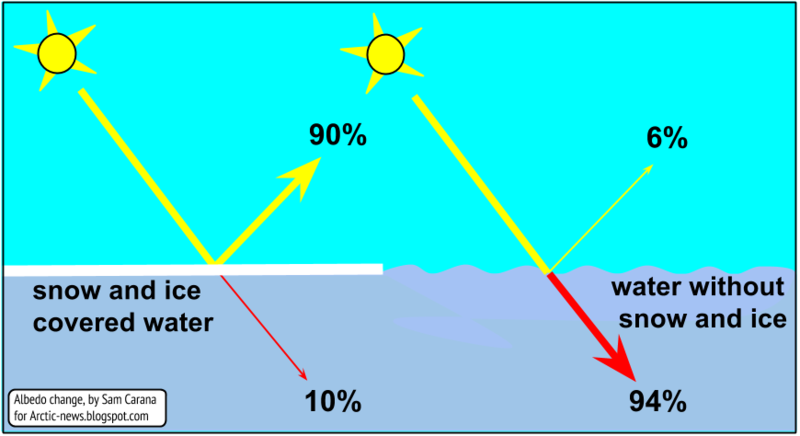 This is illustrated by the image on the right and by he image below, from an earlier post, which further shows that the amount of solar radiation received by the Arctic at the time of the June Solstice is higher than anywhere else on Earth. Collapse of the sea ice could occur even faster than decline of sea ice extent may indicate. Rapid loss of sea ice thickness has taken place over the years, as discussed in a recent post. 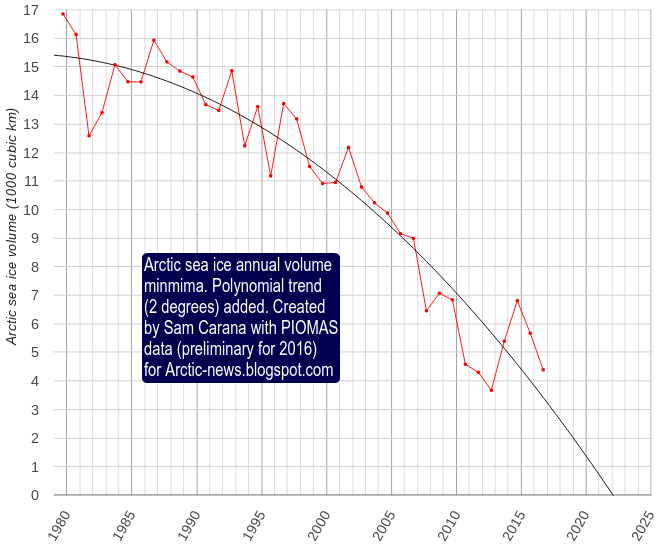 A trend based on PIOMAS volume data (preliminary for 2016) points at a collapse around December 2021/January 2022, as illustrated by the graph below. Indeed, Professor Peter Wadhams warned about this in 2012: "global warming will increase the intensity of extreme weather events, so more heavy winds and more intense storms can be expected to increasingly break up the remaining ice, both mechanically and by enhancing ocean heat transfer to the under-ice surface." Thin sea ice is more vulnerable to the stronger storms that can be expected to hit the Arctic Ocean during the northern summer more frequently, and they could push huge amounts of ice out of the Arctic Ocean. This buffer is now largely gone and further decline of Arctic sea ice means that a lot more heat will be absorbed by the Arctic. As the water of the Arctic Ocean keeps warming, the risk increases that methane hydrates at the bottom of the Arctic Ocean will destabilize. Increases in temperature due to albedo changes and methane releases in the Arctic will go hand in hand with further feedbacks, in particular increased levels of water vapor in the atmosphere. Here's the danger: As decline of the snow and ice cover in the Arctic continues and as more methane gets released from the seafloor, temperatures will rise rapidly, triggering further feedbacks such as a rise of water vapor in the atmosphere. Keep in mind that what makes heat unbearable is a combination of high temperatures with high humidity levels. Furthermore, water vapor is a potent greenhouse gas that will further accelerate the temperature rise. Taken together, we are facing the possibility of a 10°C temperature rise within one decade. 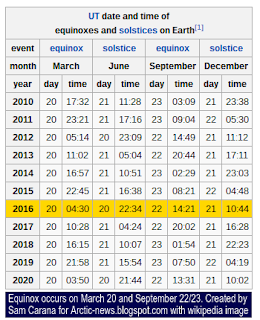 The image below, from the extinction page, shows that we may well be on a trend that is rising even faster than the rapid temperature increases in 2016 may indicate. Indeed, a large part of global warming is currently masked by aerosols and, as we make progress with the necessary shift to clean energy, the full wrath of global warming looks set to become manifest soon. Risk is the product of probability and severity. The risk of a 10°C temperature rise is incalculably high. On the severity dimension, the impact of such a temperature rise is beyond catastrophic, i.e. we're talking about extinction of species at massive scale, including humans. On the probability dimension, this outcome appears to be inevitable if no comprehensive and effective action is taken. Above danger assessment adds a third dimension, i.e. timescale. A 10°C temperature rise could eventuate within one decade and this also makes the danger imminent, adding further weight to the need to start taking comprehensive and effective action, as described in the Climate Plan. I believe extinction of our species depends on the levels of N,O,Ar,and CO2 in the troposphere. The further we drift from current levels and how rapidly these variables change will play a major role in our demise. Obviously this is not the only risk involved as you've aptly presented. 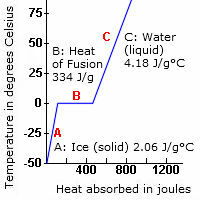 Zero ice could occur even earlier. 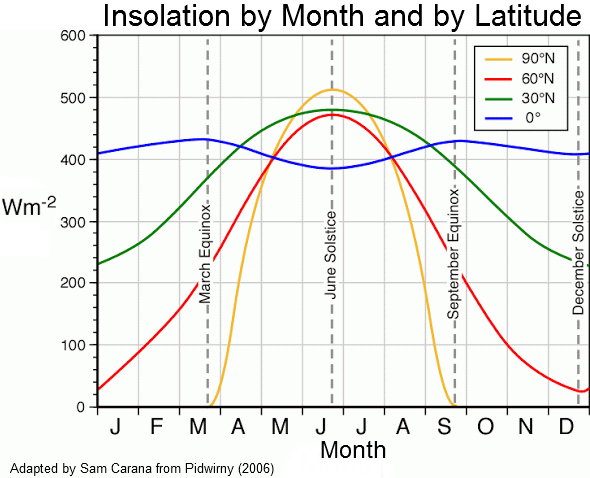 The maximum at the start of the chart compared to the minimum appears to increase in the difference between the two over time. Such a difference could grow even more. Plus once zero is reached the maximum will undoubtedly become lower within a few years at an exponential rate. The smaller the ice the faster it melts. Hopefully my observations are askew. I agree, zero will occur faster than we think. Albedo change is rapid and will have more impact than expected. 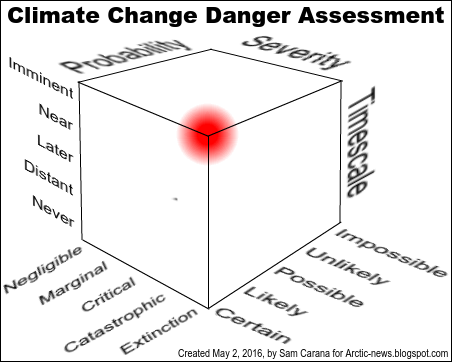 The graphic of the cube of risk probability stands alone relative to value in actually getting the world to go full tilt for keeping Earth w Sea alive because it mimes the meter cube of centimeter size sugar cube's pile of Carbon Dioxide, max pile+ 280 but ;now more are added each year. The pile grows by more than 3 per year, That's fastest Real.. It's now official, we passed "peak carbon". The thing that explians why CO2 concentrations are growing faster than ever and that we laked about last May. I don't know if you listen to Radio Ecoshock, but they talked about it this week. In my opinion, it's the worse climate news so far. I wrote an article about it.